Two boss babes are drinking a cup of hot coffee in a cafe (yay for hot coffee not microwaved three times, amiright?). Boss Babe 1 (BB1) asks: What’s your wildest dream for your business branding? 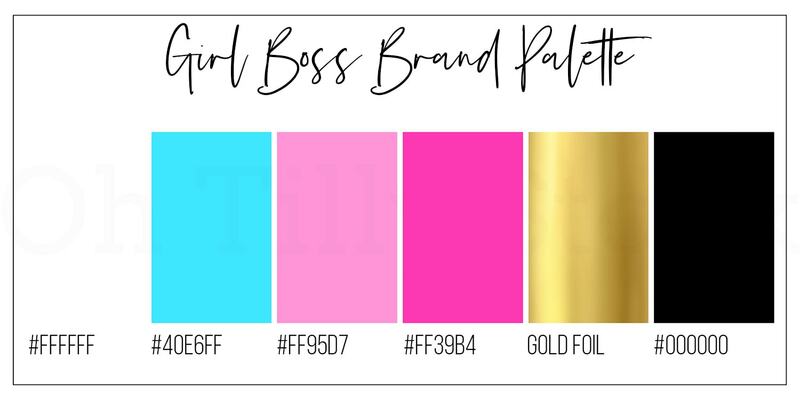 Boss Babe 2 (BB2) replies: Oh girl, to have every single styled stock photo to be released in my brand colours! BB1 & BB1: *throw heads back* Hahahahahahahahahahahahahahaha. Waiter, more coffee please. 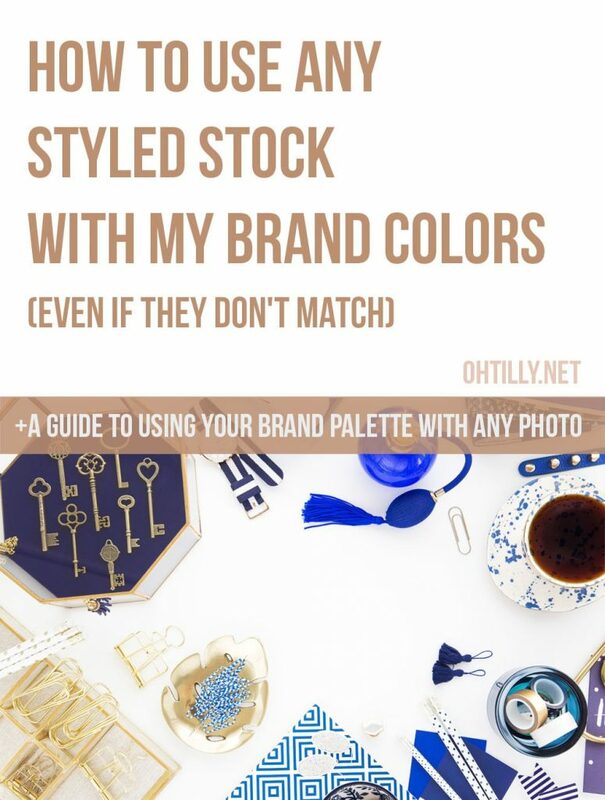 I know we all WANT millions of gorgeously styled images that are a perfect match for our brand palette. Images that seem to blend seamlessly with our aesthetic so that we can have an unlimited supply of photos for our blog posts, pinnables, websites, AND social media. So that we can share in Facebook groups, increasing our reach and interaction all the while making us look like we’ve spent 5 grand on a branding photographer to come out and shoot with us personally. 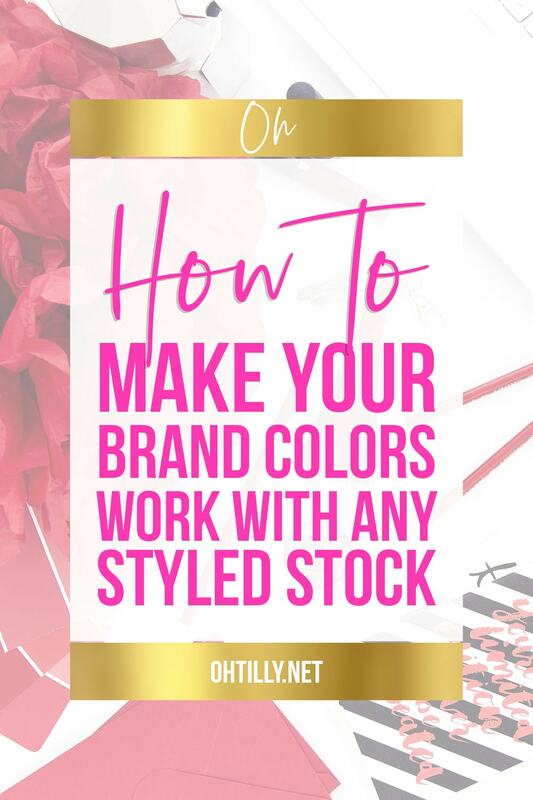 But the truth is that unless you have that kind of budget, you are probably looking at a styled stock subscription or even less consistent free styled stock. Which means you are working with all kinds of colours and themes. 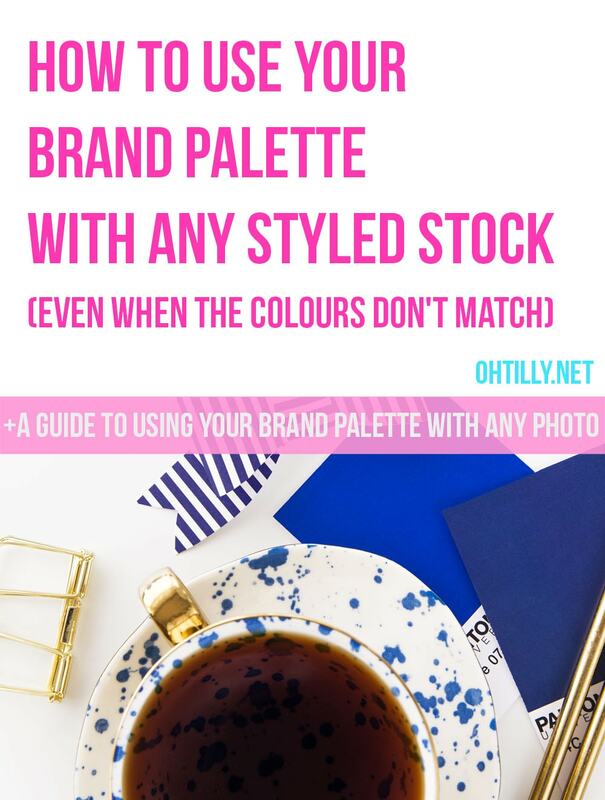 Many of which don’t match your brand palette and it can be SO frustrating trying to work out how to create all the graphics that a business needs with photos of all colours and styles. 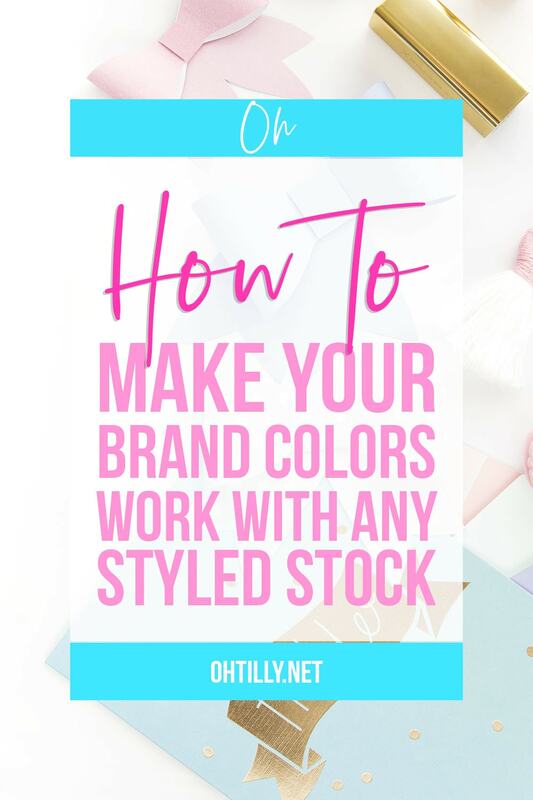 The good news is that you don’t have to have laser beam focus looking for your colours when scrolling your Oh Tilly Styled Stock Subscription (ps you can search by colour in our library). 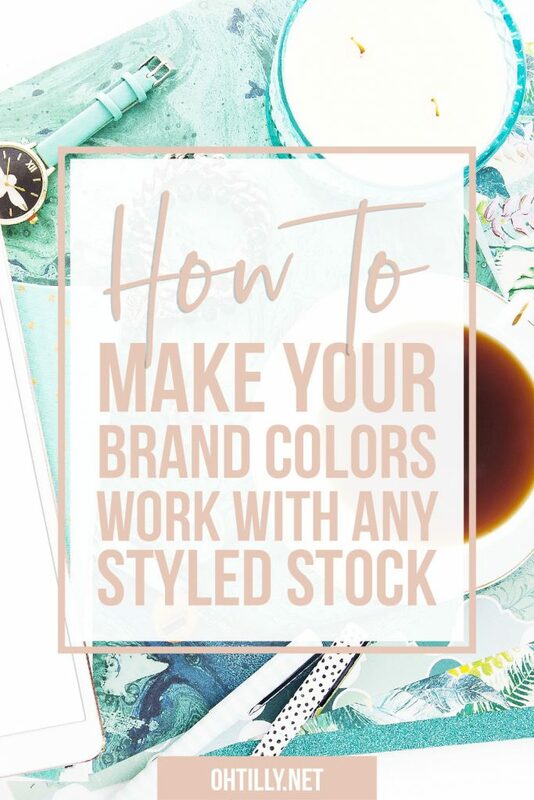 I am going to show you how to use ANY styled stock, no matter how absurd the colour difference, with your brand palette and still keep a consistent brand look online! Whether you are using Canva or Photoshop or Illustrator – you can add elements (shapes like rectangles and circles etc) over your original image. 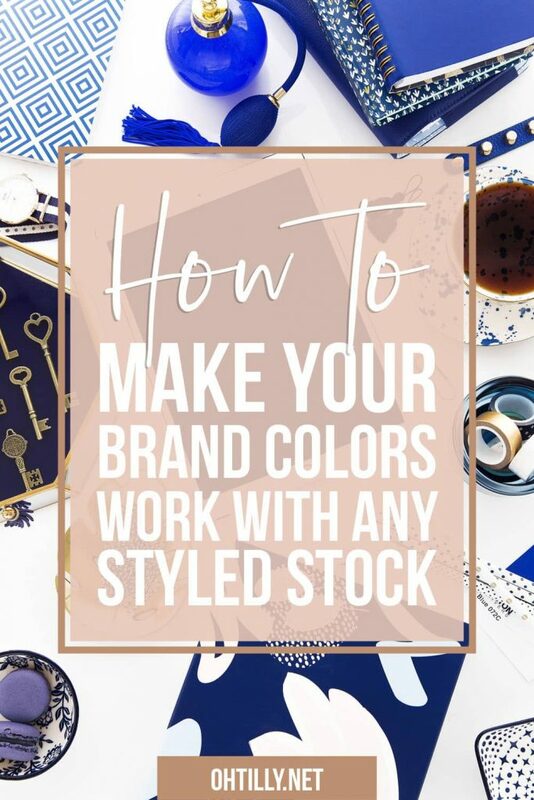 These elements can be in plain black or white, so that you may add text in your brand palette, or you can have the element coloured from your brand palette and add text on top in either another brand colour or plain black or white. Remember to play around and get a feel for it to see what you like best. 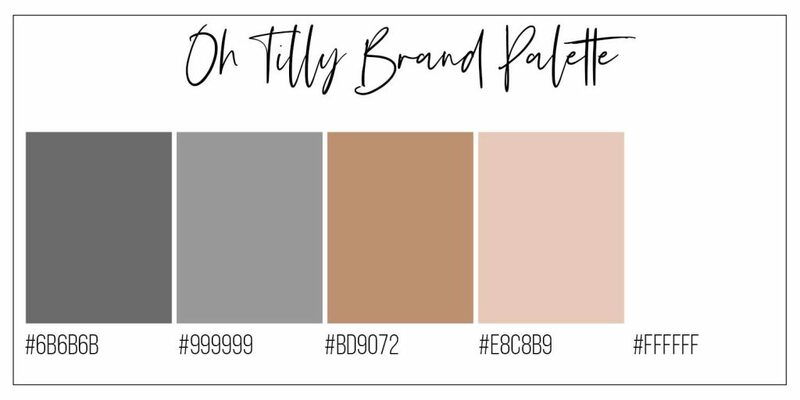 With these muted greys and peachy pinks and bronze colours it seems like there is a lot of styled stock out there that wouldn’t work with this palette. (yes there’s also a lot that will, but not always suited to my needs). So I add elements over the images in my brand colours and then add text or branding on top of that as needed. Here a simple rectangle over a lot of the background photograph can make it appear as if it belongs to my branding. ⇑ Some of the elements have a small amount of transparency so that you can still see the image behind them. While other times a solid coloured element is necessary to stop a graphic from appearing too busy. 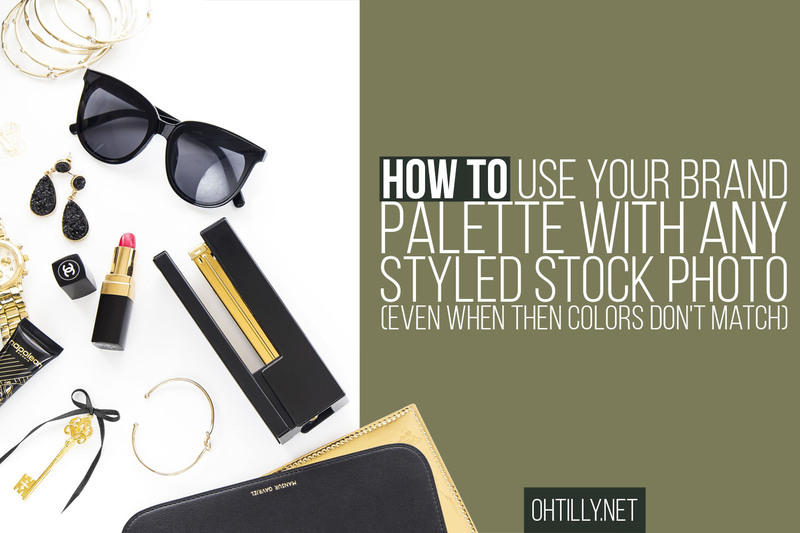 Navy, greens or bright yellow don’t seem like they could ever work, but they really can. Bring in some separation by increasing the canvas size and layering and these will work as sidebars for a website or shareables on Facebook or Pinterest Pinnables. 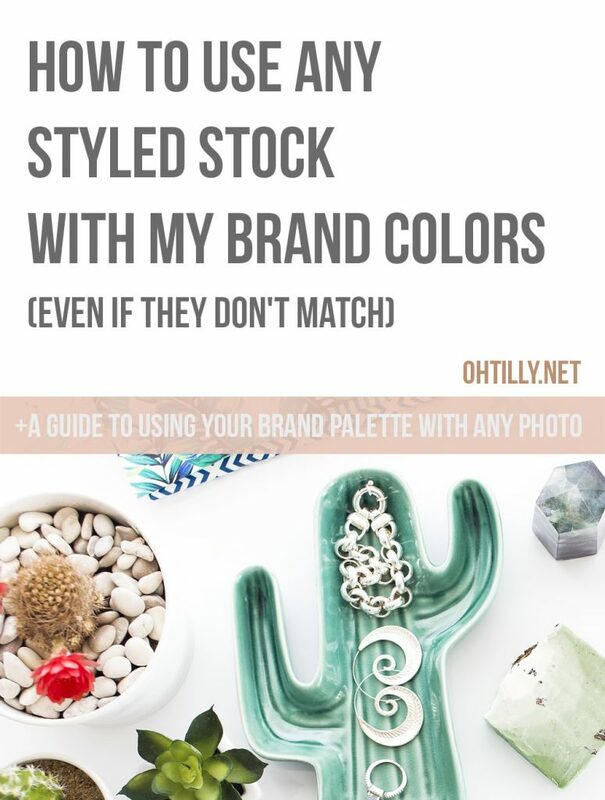 They attract attention, you can clearly see the Oh Tilly name and brand colours, but I’ve utilized images that do not fit into my brand palette. ⇑ Now scrolling along on Pinterest or your Facebook feed these would not look out of place. 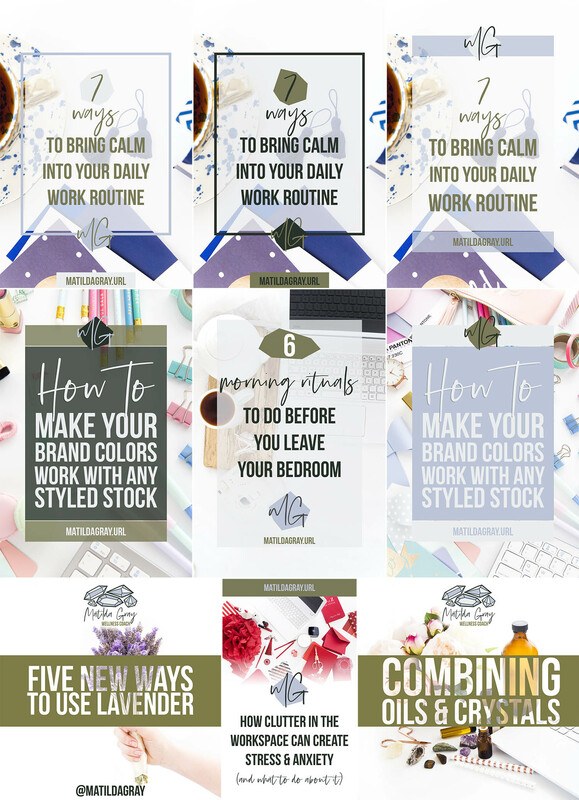 And when creating a shareable image for each page of your website or blog post you share, this sort of consistency becomes a part of your brand’s aesthetic online. People begin to recognise your graphics. What about a natural palette for someone in the wellness industry? This palette is inspired by lavender plants and while in nature the greens and muted purples go well together, they’re rarely found in styled stock photos. 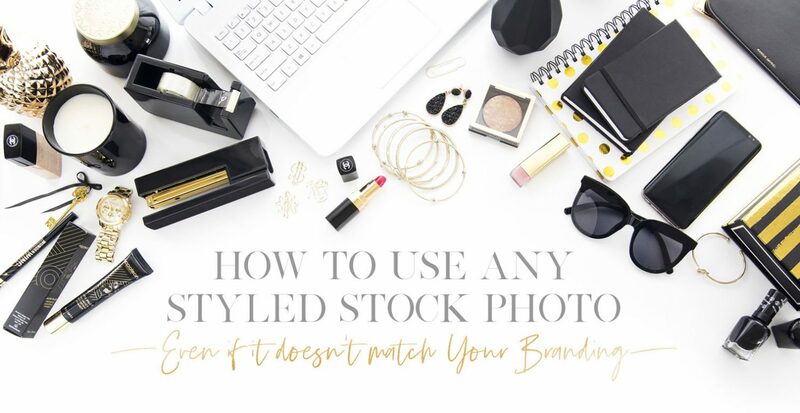 Lucky you don’t need matching photos to make your brand work! The old rectangular element over the background trick. 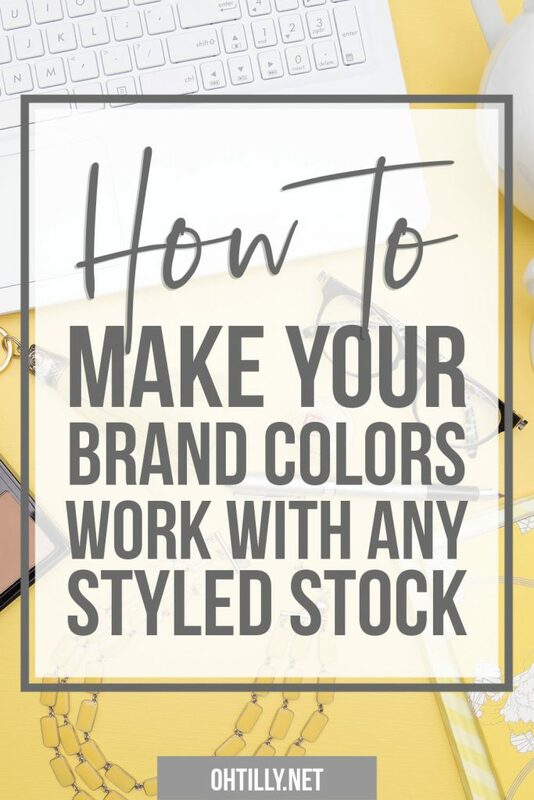 ⇑ Also, in these last three a single band of your brand colour across the middle or top or bottom of the image, or increase your image canvas so that you can separate your brand colours with a large section of white space. The fade/gradient (in the centre image) helps to blend the bright red of the styled stock photo into the area where the muted earth tones are used. What about a bright Kate Spade-esque palette like this one? In the Oh Tilly Styled Stock Catalogue there are so many series that would work with a palette like this, but sometimes you want to use the latest images that have come out. They might not have colours in common, but using these tips you can make them work for your business graphics. ⇑ Separation and colour overlays with low transparency to let the styled stock photo integrate with your design. ⇑ Try your background elements in plain white and use your brand colours for the text, or switch it up! 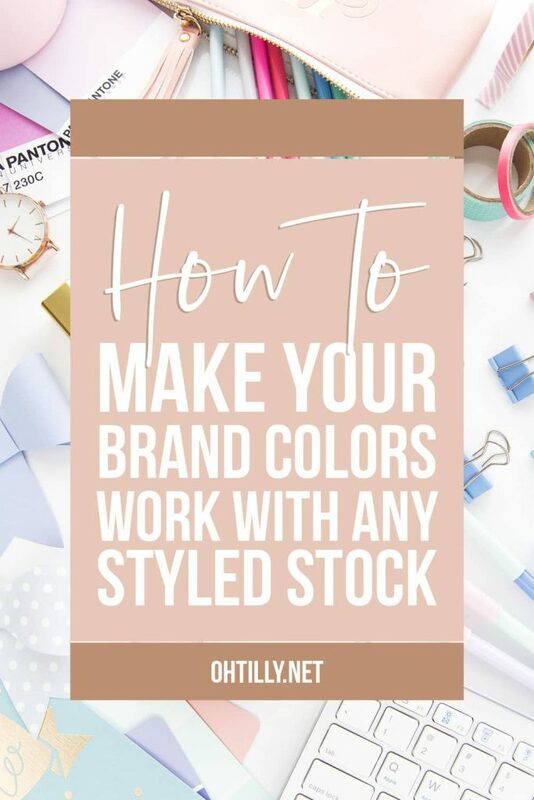 ⇑ If your brand palette includes any patterns or textures (maybe foils or glitters) then you can also use these for the text or solid elements over your stock photos. In the second image above the same background image has been used, but it has been ‘MUTED’ with a solid white overlay. 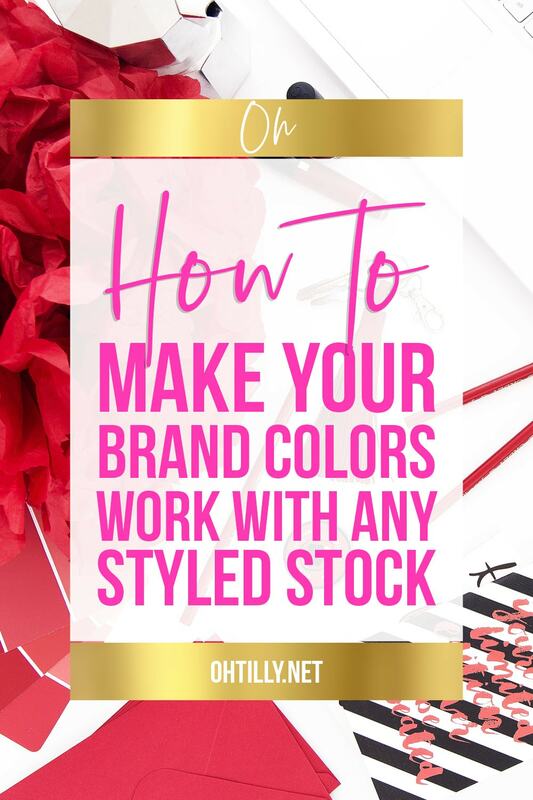 This is another way to make your brand colours stand out. You can also alter backgrounds in images by adding a solid element that touches the edges. 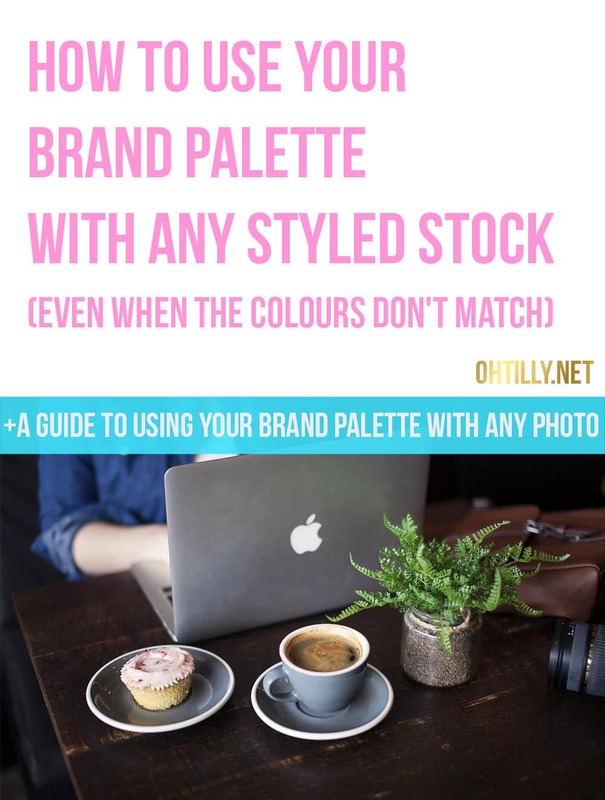 Many of the Oh Tilly Styled Stock Photos have large areas of negative space and this makes it easy to add background colour using programs like Canva or PinMonkey. 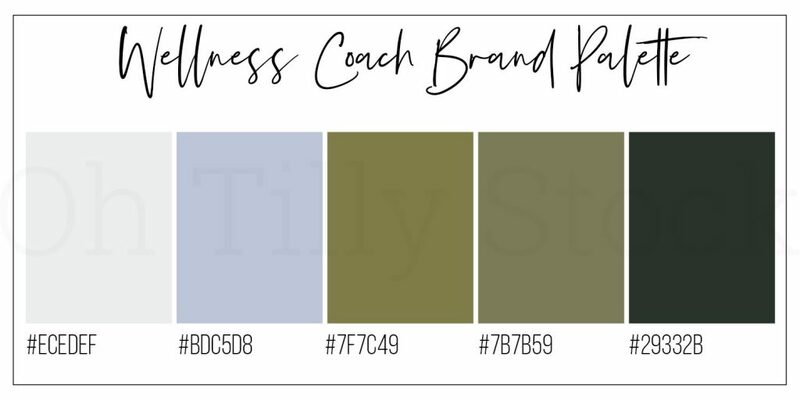 ⇑ Despite there being no black or gold in the wellness coach brand palette, this works really well. 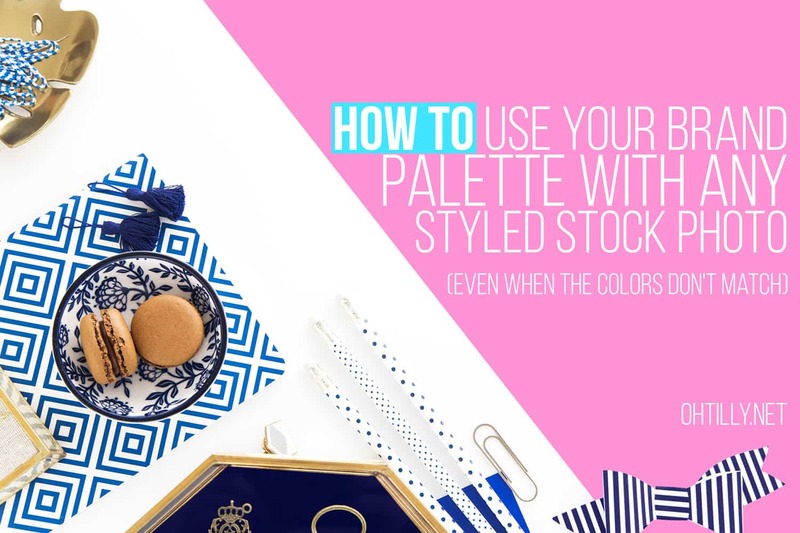 ⇑ Even the deep navy tones in this styled stock photo can work with the soft pink of the bright girl boss palette. 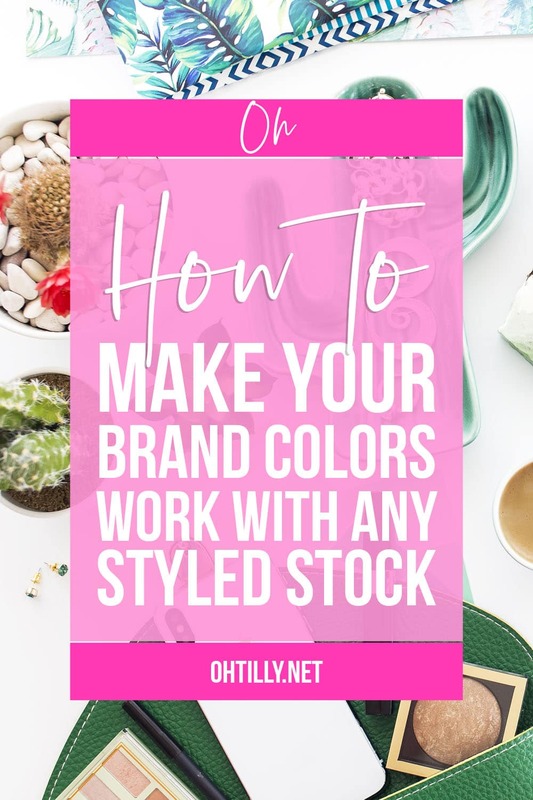 I really hope that this post has filled you with ideas and information to help you to always feel empowered to use your styled stock photos, regardless of the colour and style. You can do it! For a recap on how to add elements and text to canva you can check out this Canva Tutorial. Two boss babes are having their weekly coffee again. BB1 asks: How’s that styled stock photography dream of yours going? BB2 replies: I’ve got it all worked out. 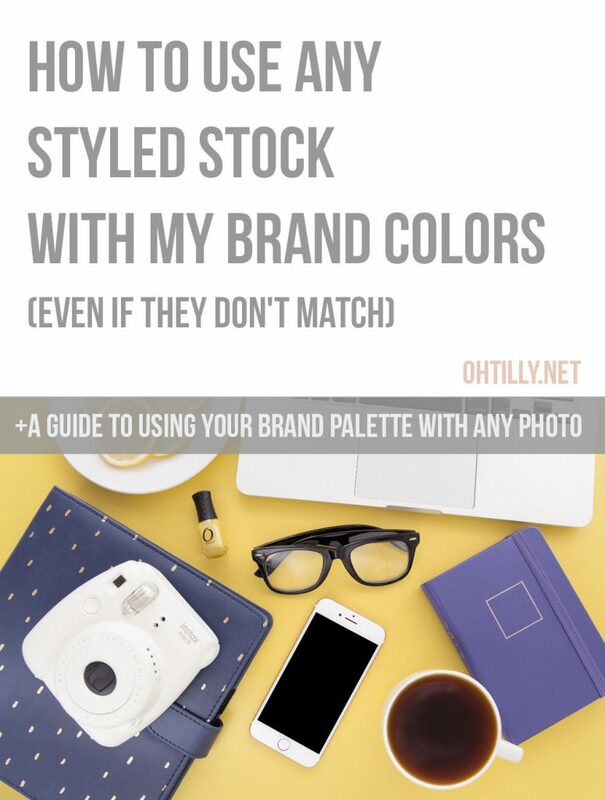 Now I can use ANY styled stock photo with my own brand palette and still create a consistent and luxury online brand image. BB1: ANY Styled Stock Photo? Ps Don’t forget to share the love.